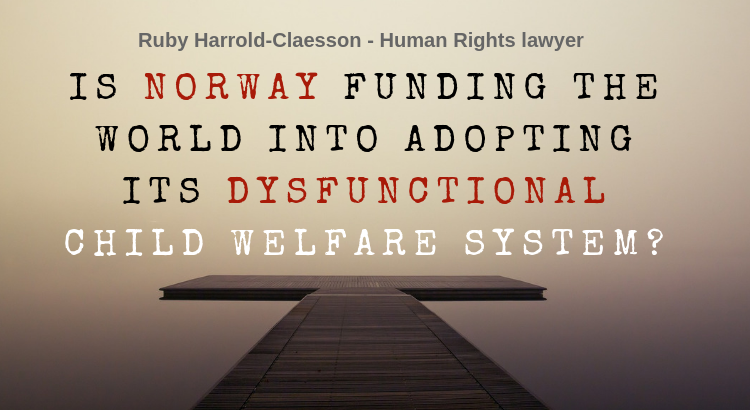 Is Norway funding the world into adopting its dysfunctional child welfare system? “Norway’s Children’s Minister, Linda Hofstad Helleland, was right. Not in her claims that Norway’s CPS is the best CPS, but that “other countries in the world will copy Norway’s system”. In February 2014, I was invited to Lithuania for meetings with politicians, to lecture at conferences and to give a series of talks and TV and radio interviews. Shortly before the Conference started, my hosts informed me that a representative of The Nordic Council of Ministers Office in Lithuania, Bo Harald Tillberg, was registered to attend. He questioned the information that I gave about non-investigated and therefore non-prosecuted child deaths in the Swedish CPS system. He asked for one example: I gave 5 examples off hand. During the break, Bo Harald Tillberg came to talk to me. He told me that my giving negative information about the Swedish system would impede trading with Sweden. I replied that I can only tell the truth. In August 2018, the NKMR Facebook group got some new Lithuanian members. They gave as their reason for wanting to join was the fact that their Parliament had passed a CPS law, and they wanted to know what to expect. In June 2015, I was invited to Estonia by politicians and family rights activists. During a meeting with politicians, one politician informed that Norway had given 20 million Euros to Estonia, to build up their child protection system. So, Norway’s Children’s Minister, Linda Hofstad, is right in her claims that “other countries in the world will copy Norway’s system”. Are Norwegian funds used to blindfold other nations to the Human Rights abuses currently taking place in Norway? Norwegian grants support Bulgarian judges at the ECtHR. Norwegian funds to Romania to support silence and the Norwegian illusion? Money can buy silence, but it’s not always golden. Slovakia accept 113 million euros from Norway. Norway funding the world into silence? International Convention on the Rights of the Family.